English rock band Temple is back with their second full-length studio album “Volcano” as they continue to hone their sound in the three years since their critically acclaimed debut album “Sun Structures.” Like a sculptor with a piece of clay, Volcano released by Heavenly Records, confirms that this band has learned and grown from their 2012 freshman release and are perfecting their sound around their own vision; with more sophisticated eerie synths reminiscent of 70s psychedelia. By definition, it would be easy to designate the psychedelic quartet and their new album to the synth-pop section (for the few record stores still around), but the new album offers a consistent current of melodic harmonies, with some surprisingly strong break beats and gritty hooks layered in. 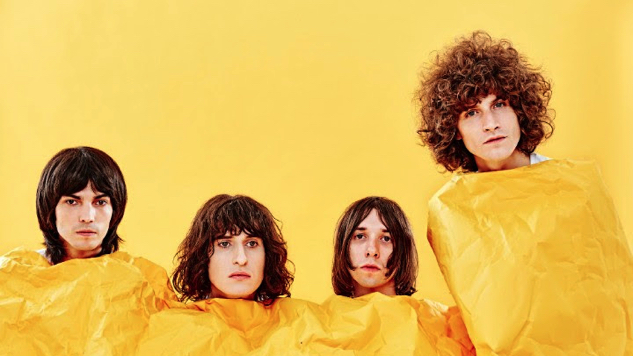 Produced in James Bagshaw home studio, the album itself plays out like a live-set and conjures up impressions of an old mythical temple, a temple with an out of space laser light show.